1100sqm plot in town with view, municipal water and Escom connections close. Smallholding with large renovated house and plenty water turn from the mountain 8000 sqm. plot. 2 bedrooms with bathrooms, kitchen dining, TV and lounge, study. Shed and undercover parking Patio overlooking town and mountains. 2 large cement dams for 2h30 / 15 days water turn. Vineyard and apricot orchards. Cottage in garden for family and friends (or rent out). 2 bedroom house with bathroom, open plan kitchen, dining. TV / entertainment area with barbecue area. 1000 sqm plot with view of mountains. Outside workshop. Patio covered parking for cars. Escom "koopkrag" and municipal water. Ideal for lock-up-and- go or permanent. Smallholding just outside town with municipal water and 1hr / 15 days water turn from the mountain. Double story house, 3 bedrooms, 2 bathrooms (Showers), open plan lounge, dining. Kitchen. Outside patio overlooking mountain with outside bathroom (bath). Wendy house. Completely on solar (inverters and Stihl petrol generator included). 4 bedroom house in town with 30 min / 15 days water turn from mountain. Plenty water. (+- 40 000L per 30 minutes). Cement dam for water turn. "koopkrag" electricity, municipal water (also from mountain). 2 bathrooms. Kitchen with wash up area. Single garage. Dining room and Lounge/TV room. 1071 sqm 2 extra plots (1071 sqm next to house. Smallholding out of town with 3 bedroom house, double garage, wendy house with outside bathroom. Borehole 2 x 2500L tanks. Vegetable garden, +- 90 olive trees (3 years old), 5000 garlic seeds just planted. All under irrigation. Small 2 bedroom house (plot) 535sqm now available in town. 2 bedrooms, bathroom, large kitchen, lounge. Outside patio. 10 minutes / 15 days waterturn from mountain. Municipal water and Escom power. Quiet street and walking distances to shops. Mountain farm situated next to Rooiberg Mountains with magnificent views. Renovated house with 2 bedrooms, 2 bathrooms. Open plan lounge with fire plase, new modern kitchen. Loft - study or bedroom. Irrigated veggie garden with tunnel. Swimming pool. Large shed with store rooms, Servitude dame for house hold water, swimming pool and garden. Need a hide away place - this is the place for you. 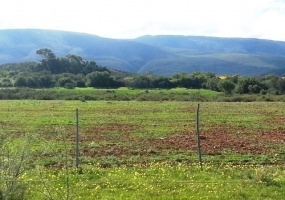 Magnificent open land situated next to the Rooiberg Mountains with views. 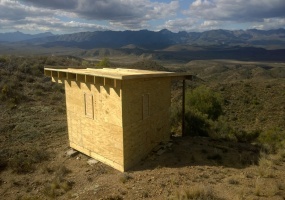 Come and build your Karoo house in the mountains. Private and secluded. Ideal for weekends away from the city noise or retirement. Will not be able to farm - only household. Bore hole with available water of +- 2000L/hour. 2 plots x 235sqm each in quiet area of town. Ideal for lock-up-and-go. 535sqm plot in town with 20 olive trees. 6 x 3 Wendy house and 6 x 3 patio with bathroom. 3 x 3 m Wendy shed. Municipal water. and 10 minutes / 15 days water turn from mountain. Buy plot and Wendy house(s) for R140 000 or just the plot for R80 000 Ideal for lock up and go. SOLD IN MARCH - 1.8ha smallholding on side of town. 6 bedroom house with bathroom, kitchen, dining and lounge. 4 bedrooms inside and 2 outside (patio). "koopkrag" electricity and municipal water with 2 water tanks. Outside buildings: flat and garden cottage, store rooms and garage. Large dam for 7hr / 15 minutes water turn from mountain. Vegetables with irrigation. Good income. 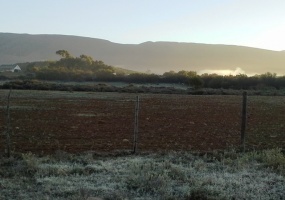 105ha situated in the Moose Valley Nature Reserve. Beautiful views and plenty roads to take a drive. Small wooden cottage built for weekend stays. Household water connected. No electricity. Newly renovated house and flatlet in town. House - 2 bedrooms, bathroom (bath) , kitchen and open lounge/TV room. Wooden floors. Outside barbecue area Flatlet - 1 x bedroom with bathroom (shower), open plan kitchen, dining, barbecue area and lounge. Reed ceiling. Carport for 2 cars. Neat and clean. Ideal for lock-up and go or permanent. 3.4ha with 2 stone cottages and stone venue next to Groot River. Magnificent views and private. +- 1 ha fenced around cottages and venue . 2km out of town. Stone cottage (2 bedrooms each), bathroom each (shower with gas geysers), front open plan lounge, fire place each. Patios overlooking mountains with double sink basins. Large grass and thorn trees in front of cottages. Magnificent Old Victorian House in Town neatly renovated for the perfectionist!. 3 bedrooms plus library / study all with original wooden floors. Lounge with fire place, dining room. Kitchen with oven and hob. 1 bathroom (shower). Outside patios (with side room). Outside laundry with separate toilet. Outside flat with large bedroom, small kitchen, bathroom. 6000sqm vacant land in town with bore hole. Ideal to build your Karoo house. Bore hole (no Pump). Municipal water with Escom Power connection available. Walking distance to business area of town. WAS R695 000. NOW R580 000. URGENT SALE 1.1ha smallholding for the nature lover. Private and quiet area. Municipal water. View of mountain. 1 bedroom and open lounge/kitchen, bathroom wooden house with wooden deck. Outside "bush" bathroom. Plenty trees. Small fenced camps for animals. Ideal for the lock-up-and go person (or permanent). Walking distance to main business area. Beautiful and well looked after Small Holding with Lifestyle living at its best. - 3km out of town. Private and safe. Ideal for self sustainable farmer. 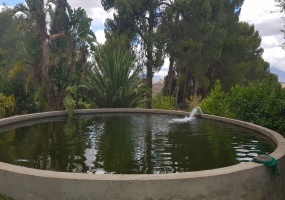 12.9ha situated next to Rooiberg Mountains with 5hr / 15 days water turn from mountain fountain. Gravel dam and cement dam for water turn. Municipal water from mountain. 8 x 5000sqm (half hectare) plots on side of town. Two front plots (next to R327) with business rights. Municipal water and Escom Power close. Selling Price : 2 x front plots - R250 000 each. Large plot subdivided in 3 with views of mountains. Municipal water available. Walking distances to center of town. Ideal for lock up and go cottages. Large plot on outside of town with 1hr / 15 days water turn from mountain. Ideal for small scale farming. Large vacant land on side of town with water turn from mountain. 1.1591ha with 1hr / 15 days water turn from mountain. Now lucern land. Ideal for small scale farming. Large plot in town (subdivided in 3) with water turn from mountain - 15 minutes / 15 days for each plot. Municipal water also available. Ideal for lock-up-and-go or sustainable living. Walking distance to main center of town. Each plot 1071sqm. Large plot in town with 30 minutes / 15 days water turn from mountain for each plot. Municipal water also available. Ideal for lock-up-and-go cottages or sustainable living. Walking distance to center of town. Newly renovated house in town with 3 bedrooms, study and outside flatlet, large lounge, dining. Kitchen and wash-up area (need renovations), two bathrooms (1 full), fire place, wooden floors, internet and 'koopkrag" electricity. Lovely garden with assorted fruit trees, 30 min / 15 days water turn ( +- 30 000 - 50 000L - depending on rainfall ) from mountain fountain. BEST BUY IN TOWN!!!! 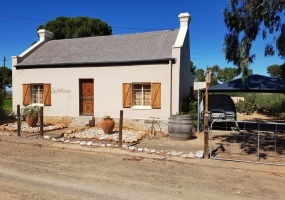 Newly renovated Karoo House in town with 4 bedrooms and 2 x FULL bathrooms. Separate kitchen (new) with dining room, lounge (potbelly fire place), Patio with view. Outside buildings: 2 single garages and 2 store rooms. (Easy to change into outside flatlet). Outside barbecue area with small garden. Ideal for lock-up-and go or permanent. 131ha in mountains with views. 4 x 4 routes. Ideal for lock-up-and-go with small piece of agricultural land. 5.4ha with magnificent Groot River and Mountain view. Ideal for lock -up - and - go. Municipal water. 138ha with Groot River frontage (next to R327), 1km out of town. Beautiful views of river and mountains. 2 boreholes (both sides of the R327). Ideal for lock - up - and - go. 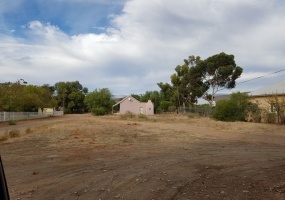 2.2ha plot on side of town with view of Groot River. Municipal water available. Ideal for lock-up-and-go weekend place. Come and enjoy our safe environment.